Here is a palpable way to look at power tool safety. 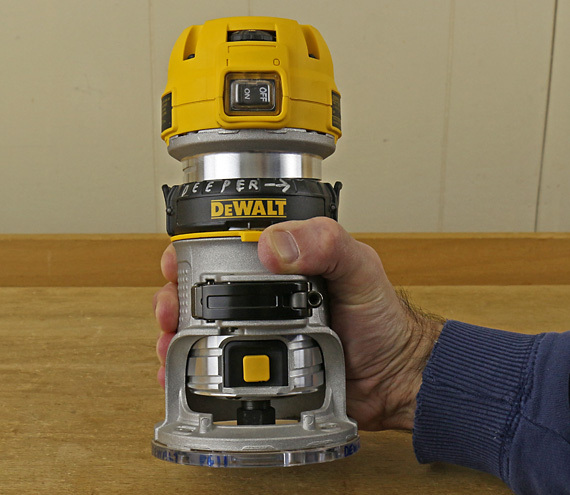 This occurred to me as I was holding in my hand the DeWalt DWP611 compact router. It is so easy to wield this little machine with one hand – it’s easier to grip than a youth-size football – that I sensed a bit of over-confidence sneaking in as I was preparing to put it to the wood. This little beast, however, has a tail that plugs into an electrical outlet, so it can generate 1.25 HP. Question: are you more powerful than a horse? Moving over to the table saw, here’s another question. The tip speed of a 10″ blade at 3450 RPM is 103 MPH. Think about kickback. Are you faster than that? There is no way the woodworker is strong or fast enough to beat an out-of-control power tool. Therefore, the operation to be performed must be fully controlled and fully predictable. There is no room for doubt or hoping. You must know what is going to happen before it happens. It is difficult to over-emphasize: we ultimately must control our power tools with our brains. Knowledge, proper setup, patience, and alertness are absolute requirements. Without them, we’re just not good enough. Good post and I would say the same things about driving. I asked a neuroscientist once: given that your nerves take time to transmit stimuli from receptors (like skin and eyeballs) to the brain, and that your brain takes time to process stimuli into useable information for your consciousness, what is the lag time between now and what you experience as now? The sobering answer: usually about 1/4 of a second. So as you push the wood through the tablesaw, what you think of as “now” is actually 1/4 second in the past. Compare 1/4 second to the amount of time it takes an object kicked back at 103 mph to travel from the sawblade the 2 feet or so to you. This is why the safety rules are important. Ha, I suspected I was living in the past. This explains it. Seriously, good point. Machines are faster than us. That video is actually showing an “ejection,” which is a very fast horizontal ejection of the work piece off the saw table. A “kickback” happens when the work piece catches on the rising saw teeth at the back of the blade. This lifts the work piece and flings it up and back – and toward your face if you’re standing in the wrong place – with frightening speed and power. The accepted recommendation is to use a properly aligned riving knife at all times when using a table saw, or at least a splitter when possible.